• Extremely long life and low cost. • Almost no water pressure drop for excellent cooling. • Minimal down time during cable replacement. • Less electricity used per individual weld due to superlative conductivity. • High conductivity terminals used. These terminals are reusable. • A swaged copper pipe connector is used to minimize bending concentrated at the conductor and prevent disconnections. 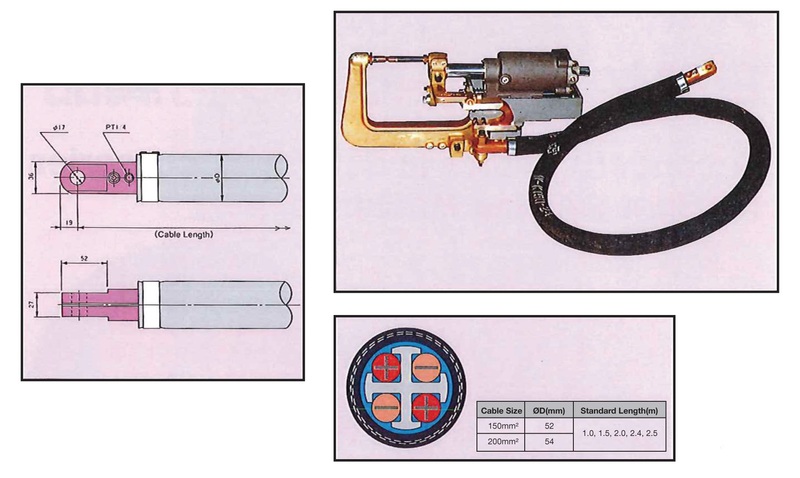 This is because the twisting and turning of the gun that occurs during the welding operation causes bending in the cable that is concentrated at the base of the terminal on the gun. This bending could easily break the cable. • There are three reason the KC-4C cable has a low impedance and a high power factor. 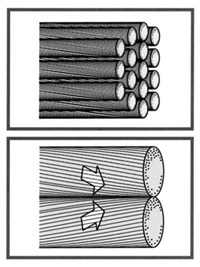 (1) Materials with a high conductivity are used for the cable terminals. (2) The terminals are crimped onto the cable. (3) As a final step, they are also soldered to the cable. • The cooling water that enters KC-4C cable first enters a holding chamber and then flows to the plus and minus sides. As a result, the water pressure does not fall and excellent cooling is achieved. • KC-4C cable adopts a special twisting method that prevents the individual wires from crossing and rubbing against each other. This is to prevent reduction of cooling efficiency and cable breakage due to individual wire strand breakage during use for extended periods. • The reason KC-4C cables are so flexible is that the positive and negative conductors are completely separated by their insulator tubes so that plenty of space is provided between the conductors and the outer hose. Furthermore, since mild stainless steel hose clamps are used, these clamps are powerful and maintain a fixed clamping pressure. Thus there is no need to worry about water leaking from the cables.